Today, we’re excited to announce that we’ve partnered with Walgreens to make getting cold and flu essentials easier than ever. Starting today, people who live in one of our 19 serviced U.S. cities, can use the TaskRabbit iPhone app to get their cold remedies from Walgreens delivered directly to their door. 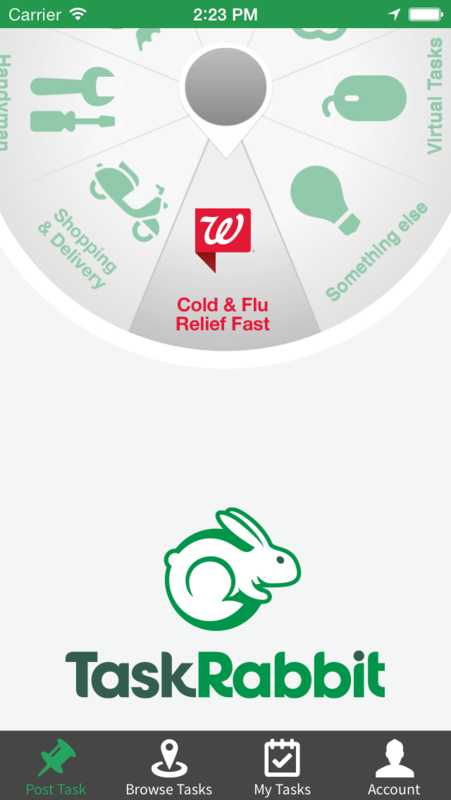 Between today and February 18th (the most common time to catch a cold, according to Gallup), a slice of the wheel on our iPhone app will be dedicated to ordering cold and flu remedies from Walgreens. Simply tap the Walgreens’ slice, select the nearest Walgreens store, enter the products needed and indicate a preferred delivery time. From there, simply select the TaskRabbit you’d like to work with and you’ll be on your way to feeling better. TaskRabbit was founded on the premise of neighbors helping neighbors — and there’s no time when we need more help than when we’re sick. That’s why we are so excited about this partnership. Feeling a little under the weather? Download or update your version of the TaskRabbit iPhone app and get healthy today with a little help from Walgreens and TaskRabbit. This idea is great! This example is the best way to tulizar technology! Greetings and success with the blog! Previous PostIt’s official! TaskRabbit has hit London!